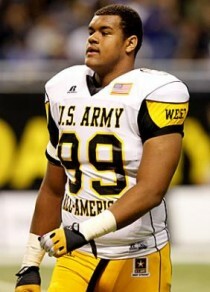 Arik Armstead arrived in Eugene last spring as a blue chip recruit surrounded by a ton of hype and promise. While he served his smaller role dutifully this past season, some fans were left wondering where that game-changing presence was like De’Anthony Thomas had shown as a true freshman. Perhaps Oregon didn’t need another game changer as guys like Kiko Alonso, Michael Clay, Dion Jordan, etc. were the leaders of the defense. Nonetheless, as the young Armstead matures into more of a starting role, his dominating presence (as seen throughout high school) will make its way into Autzen. Amidst all of the recent success, Oregon has never been the program that snags a bunch of 5-star superstar recruits like a USC, Alabama, or Texas – especially on the defensive side of the ball. 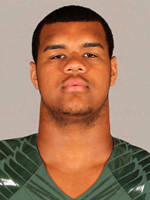 Fortunately for the Ducks, however, Armstead lived on the west coast where Oregon’s span of success couldn’t be ignored. He hails from Elk Grove, California where he played both football and basketball at Pleasant Grove High School. Throughout his junior and senior seasons there, he accumulated countless all-league and all-state 1st team honors and was eventually selected to the 2012 U.S. Army All-American game. He played both offensive and defensive line in high school while leading his team deep into the league playoffs during his junior and senior year. Armstead recorded 126 tackles, 7.5 sacks, 9 pass deflections, 1 fumble recovery, 2 blocked kicks, and a countless number of pancake blocks on the offensive line while on the varsity squad. Like De’Anthony, he originally committed to USC before signing day. However, as his stock kept rising and prestigious offers came rolling in he was forced to de-commit, open up his recruiting process, and ultimately commit to Oregon on January 29th of 2012. So what kind of player is he? And what exactly can he do for Oregon? At a monstrous 6’8 280 lbs, he is an invaluable asset on the line. He was recruited for the defensive side of the ball and should mesh well as the centerpiece in a system of complex blitzing/covering schemes Aliotti throws out on the field. Recruiting services have raved about his unique athleticism at such a large size. He has the arm strength/length to make first contact along with enough explosion to knock a majority of opposing linemen back a step or two. I see his former Duck comparison as DT Brandon Bair, who served as a very tough defensive linemen hovering near the center to plug up runs coming through the middle. His presence often required assistance from offensive guards as he would bully centers fresh off of the snap. Doing so would allow linebackers to blitz through the middle freely and also made it easier for DE’s like Kenny Rowe and Terrell Turner to terrorize the quarterback. They are similar in size and Armstead has been advertised as stronger. One thing that Armstead has worked to get better on is his technique and footwork. In high school he was able to body up and throw other guys around, but now he must use his strength strategically to shoot gaps and get in the backfield as quickly as possible. With his strength its not really a matter of if he’ll burst through the line, its when. Despite not being the defensive game-changer this year, he still managed to accumulate 24 tackles (2 for loss) and 1 sack. Devoted Duck fans will know that Armstead expressed interest in playing basketball here, in fact, it was one of the reasons he ended up at Oregon. Dana Altman did decide to redshirt him this year; however, there is no denying the skill set he can bring to the hardwood. His size and strength makes his a post presence both offensively and defensively that can body up with many of the bigs in the Pac-12. He doesn’t have the speed to beat anyone off of the dribble, but he’s been noted for his great mid-range shooting ability; something the Ducks have been lacking in the post position with Tony Woods. It seems as if we are going to be seeing a lot of Armstead throughout the next couple years. He is listed as the 4th/5th linemen on the depth chart, but in the constant rotation that is our defensive line, he should be seeing a lot more time on the field in 2013. As far as basketball is concerned, we will have to wait and see how Altman uses him. And finally, from a recruiting standpoint, Arik Armstead exemplifies the changing culture our beloved program is going through. Whether we have Chip Kelly or not, Oregon will continue to be a top-5 program that sits at the top of blue chip prospects lists of desired schools. The best is yet to come.